EPA 27 MPG Hwy/20 MPG City! CARFAX 1-Owner, GREAT MILES 20,200! Sunroof, Heated Seats, iPod/MP3 Input, Bluetooth, Back-Up Camera, Satellite Radio, Smart Device Integration, Lane Keeping Assist, Dual Zone A/C, CD Player SEE MORE! Back-Up Camera, Satellite Radio, iPod/MP3 Input, Bluetooth, CD Player, Aluminum Wheels, Keyless Start, Dual Zone A/C, Smart Device Integration, Lane Keeping Assist. Rear Spoiler, MP3 Player, Keyless Entry, Privacy Glass, Steering Wheel Controls. WHEELS: 20" X 8" SPLIT 5-SPOKE DARK SILVER machined finish, Tires: P235/55R20 M+S, POWER TILT & SLIDE MOONROOF, BLIND SPOT MONITOR W/REAR CROSS TRAFFIC ALERT intuitive parking assist, intelligence clearance and back sonar, and lane change assist, PREMIUM PACKAGE Rear Armrest Storage Compartment, Aluminum Roof Rails, Driver Seat/Steering/Mirror Memory - 3 Settings, driver's seat Easy Exit (auto away/return), HEATED & VENTILATED FRONT SEATS, HEATED MATTE LINEAR DARK MOCHA WOOD STEERING WHEEL, MATTE LINEAR DARK MOCHA WOOD INTERIOR TRIM Two-Tone Instrument Panel, ACCESSORY PACKAGE Cargo Net, Carpet Cargo Mat, Key Gloves, Alloy Wheel Locks, TOUCH-FREE POWER REAR DOOR. 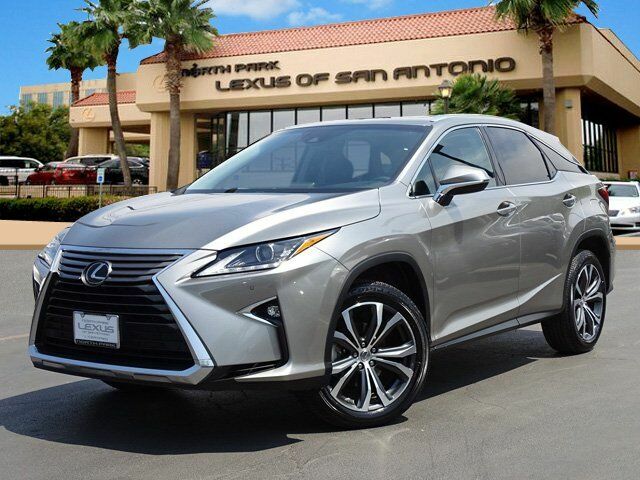 Lexus RX 350 with ATOMIC SILVER exterior and NOBLE BROWN interior features a V6 Cylinder Engine with 295 HP at 6300 RPM*. Blind Spot Monitor, Child Safety Locks, Electronic Stability Control, Brake Assist, 4-Wheel ABS, Tire Pressure Monitoring System, 4-Wheel Disc Brakes Great Gas Mileage: 27 MPG Hwy. KBB.com's review says "The RX's V6 is both powerful and impressively smooth, matched to an 8-speed automatic that should be the standard by which all automatics are judged. ".